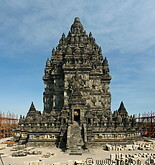 Candi Prambanan is the largest Hindu complex in Indonesia and is located in central Java, 18km from Yogyakarta. The temple complex consists of a central area with three major temples dedicated to Shiva, Vishnu and Brahma and some other minor temples, surrounded by a belt of smaller temples of which only the basements are left. Due to its impressive sculptural detail, the Shiva temple is probably the most outstanding example of Hindu art. The Prambanan complex was built between the 9th and 10th centuries by the Hindu rulers of Java. Abandoned shortly after that, the temples collapsed after a major earthquake in the 16th century. The temples were reconstructed in the early 20th century, during the Dutch colonial period. The Prambanan temple complex has been a UNESCO world heritage site since 1991.